Lucille Ball stars as the widowed Lucy Carmichael. She shares a house with her recently divorced friend Vivian Bagley and their children. The Lucy Show follows Lucy's day to day adventures dealing with the trials and tribulations of living her life as a single mother and working as the personal secretary to the demanding banker, Mr. Mooney (Gale Gordon). The Lucy Show ran for six seasons from 1962 - 1968 with the first three seasons broadcast in black & white. From season 4 onwards the show was broadcast in color. 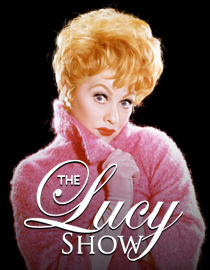 The Lucy Show was ranked in the top 10 most popular TV shows for all six of its seasons, with the two seasons shown here receiving the highest rankings (Season 5 was ranked #4 and Season 6 was ranked #2 ). The Lucy Show never reached the number one spot that its predecessor I Love Lucy held for four years, but Lucille Ball won the Emmy Award for Outstanding Lead Actress in a Comedy Series for the final two seasons.